This is a summer of trying some new things – and some old things again. The tweaks in my riding tack have been going well. The more I ride in the Balance saddle the more I like it. The mattes shim pad is also nice but I’m still working out my combination- it has lots of options. Along with the saddle I needed a new breastplate. My other is western style and isn’t long enough. 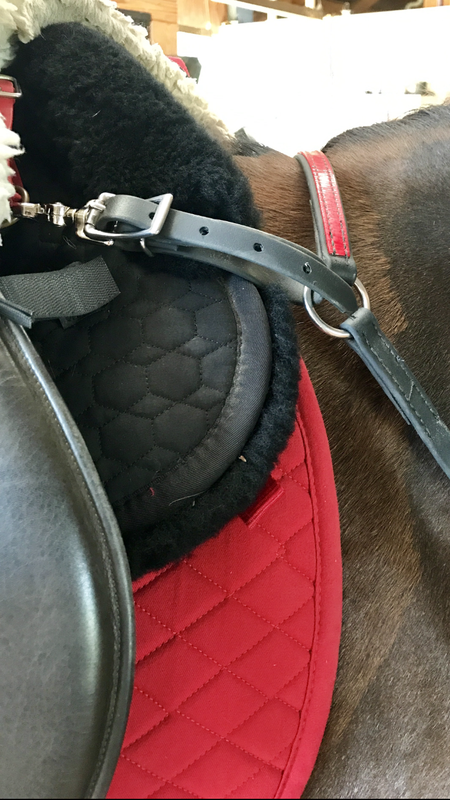 Two-Horse Tack sent me a really nice red on black biothane one to review and I really like it. The breastplate is 3/4″ with a shiny 1/2″ overlay and looks great. It’s a nice size (width) and weight. Also the English style has a whither strap which I always thought I wouldn’t like but it keeps the shoulder straps from hanging too low without having to overtighten them. 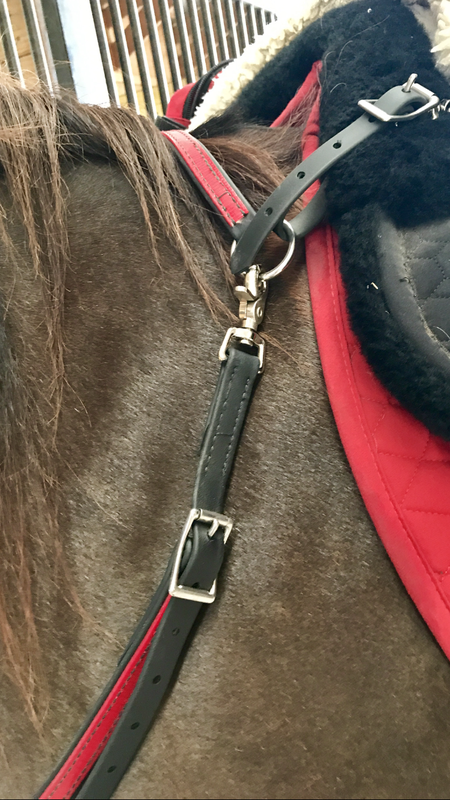 It’s easy on and off with snaps and I like that with the whither strap (which also snap releases) I can actually have the breastcollar on her ready but unhooked from my saddle as I’m tacking up or untacking depending on when I’m ready to grab it – without having to find something to set it or hang it on. I haven’t had the need to clean it aside from a quick wipe but I love biothane for super easy cleaning and except my saddle I do everything I can in biothane. It doesn’t break (at least I’ve never yet for me) and if I get behind on wiping or rinsing I toss it in the dishwasher. It comes out shiny and new. And finally: as I was looking at breastplates they are expensive. This one I was slightly skeptical of because it was half the price of the other one I was considering. I ended up with both and I liked this one better and sent the other back. It was heavier and a little wider and thicker. 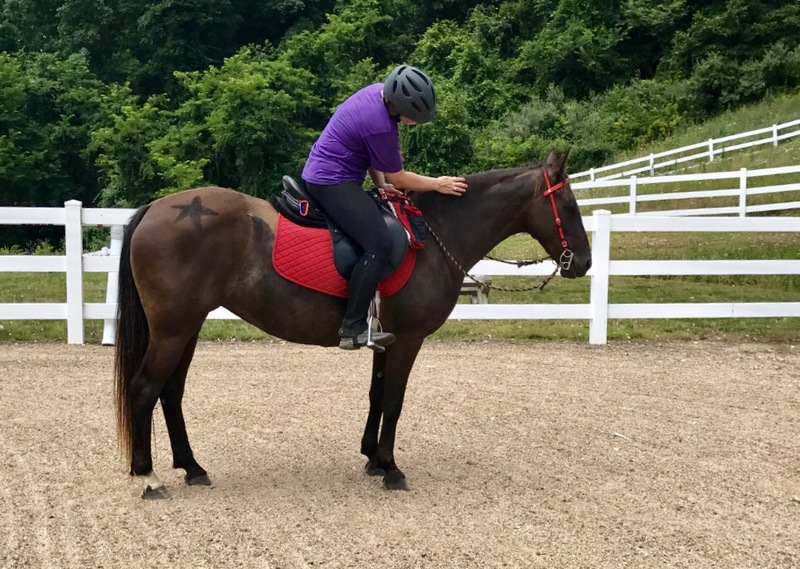 Personally I prefer the lighterweight – and though I do climb the mountains here and prefer to ride with a breastplate- my saddle fit and hopefully my riding is such that I don’t slip around much. It’s a precaution and safety measure so I don’t need a thicker heavier duty one to offset it pulling into her chest often. 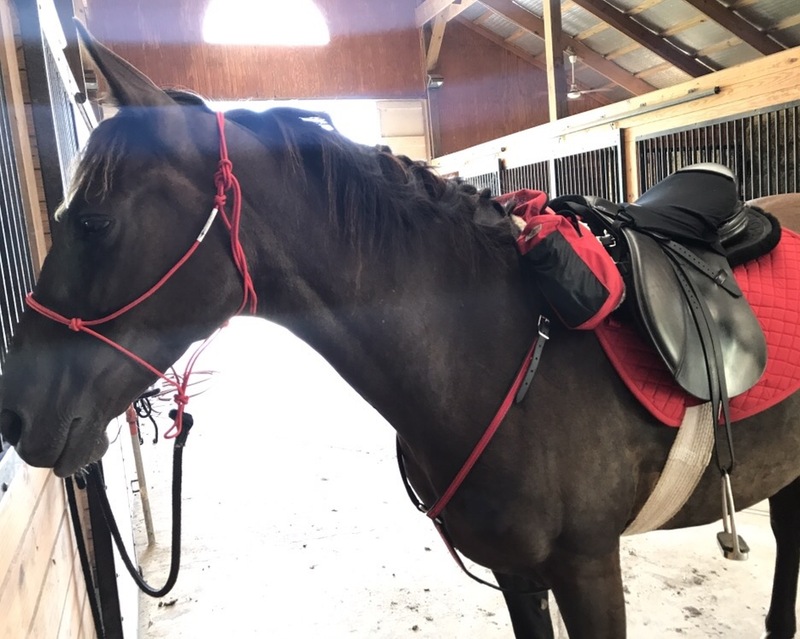 If you’re interested in perusing two-horse tack you can click HERE for their site and this month they have a 10% off deal for anyone who signs up for their newsletter. At least for me and K.
She finally has all four feet bare again and I feel a big sense of relief somehow. I’m working on slowly bringing back her toes now that she doesn’t have shoes on and I’m able to. It’s too much for a trimmer to come take 6 weeks of growth off at a time so a gradual filing is better for her. 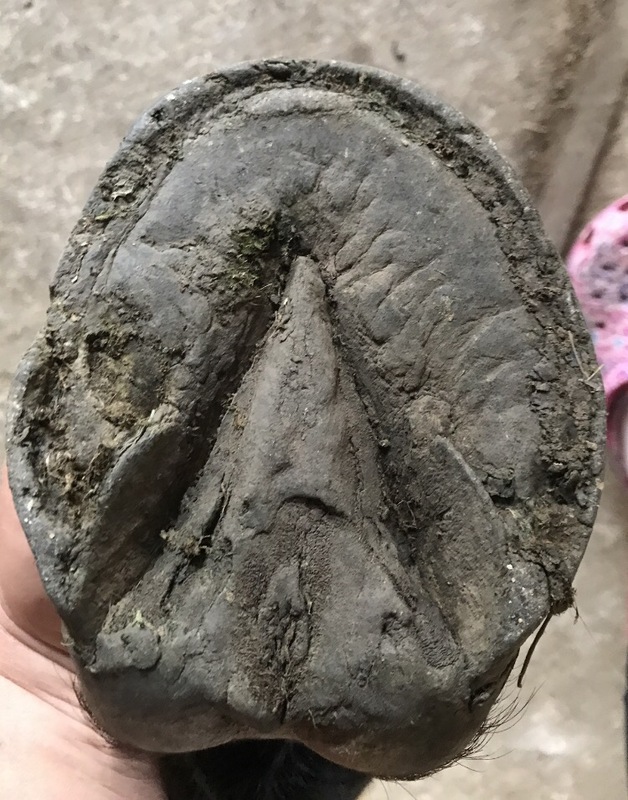 I was fascinated with the difference between the hoof with pad and shoe just removed vs. the front hoof that has been bare about a month. Front hoof- I can see how she carriers herself more on the inside of the hoof and that was also apparent with her used shoes. 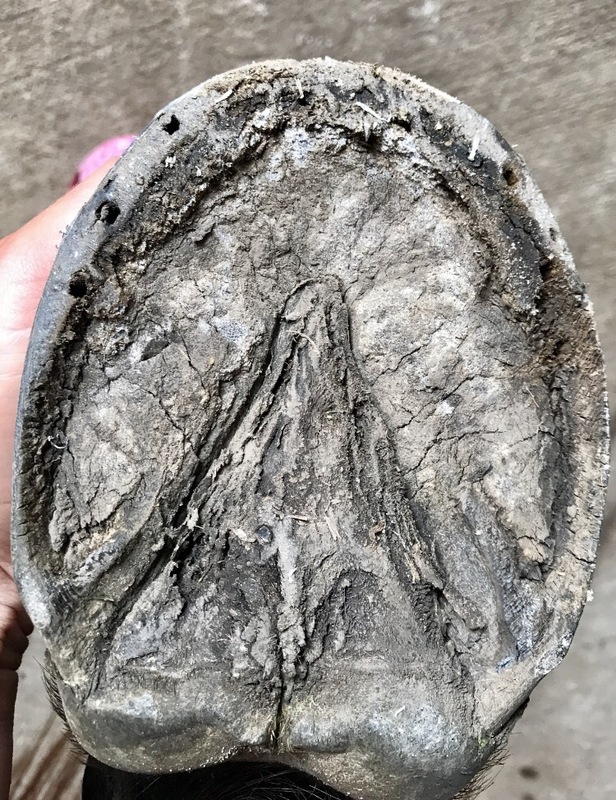 My farrier says it’s not uncommon but it’s something I’m curious about and keeping an eye on. It’s the same on both of the fronts. Here the hoof though not ‘pretty’ is doing ‘its thing’. It is developing callouses and getting tougher. I’ll have my farrier back soon but for the moment I’d like the hoof to have a chance to develop on its own then work with what it needs help with. The rear hoof just after the pad and shoe removed. The quality of the underside of the hoof is not at all like the fronts. The only way I’d consider trying this barefoot route again is if I had boots I believed in and thankfully the Scoot Boots are still going strong. I now have tried them on her back feet and so far so good. 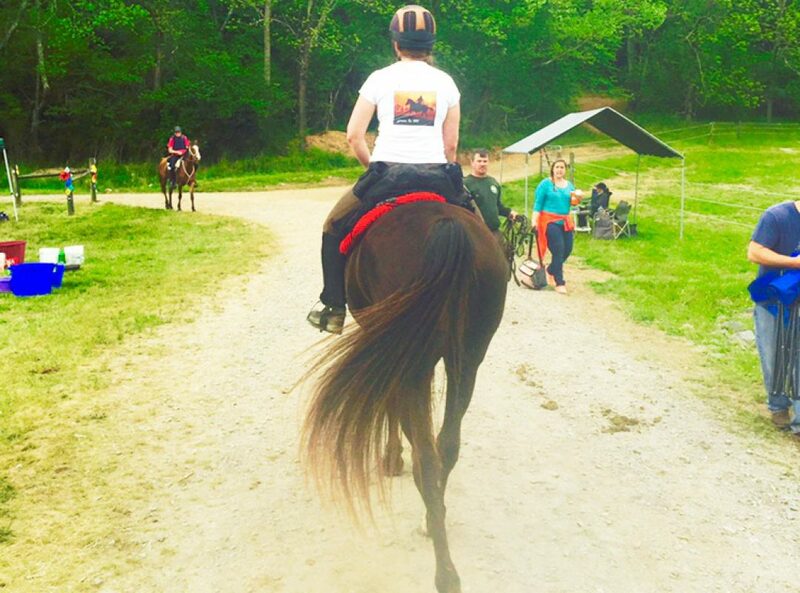 It was a short ride but included all of walk-trot-canter and didn’t lose one yet. They also have glue on shells that I may try in the future depending on my ride needs. 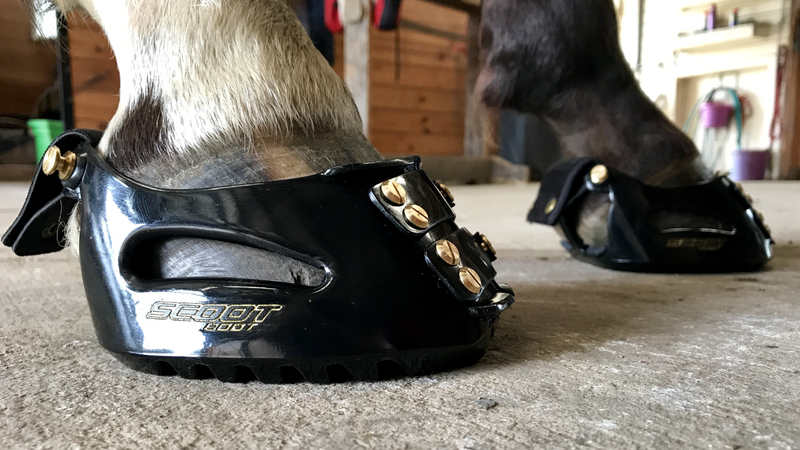 I am convinced that the horse’s movement and hoof shape all play into how well boots work. I’ve heard at least someone who absolutely loves every different kind of boot on the market. I am grateful that these boots are the ones that have worked for K because I love them. If you are looking for a boot I highly recommend them- that being said they won’t work for everyone. I’ve heard of some who have had them come off during a ride. C’est la vie! Every horse is unique- that is the fun part right? I’ve tried that- it doesn’t work. I’ve heard it from other riders and I’ve said it myself. But one thing I’ve learned about horses is the dumb small detail I missed that seems so unimportant is the difference between total failure and success. Sometimes trying again in a slightly different way can bring different results. Ok- sometimes it’s a big detail. On the OD100 I added a pad not intended to be used in a boot to my Scoot boot. It caused a rub that when I found it later in the day was pretty ugly. It was the only time I’ve lost a Scoot boot. I wonder now how likely it could be that Khaleesi dumped that boot as best she could on purpose. It was already not fitting quite right. It may not have been hard to do. How often did a boot not feel right, rub at the heel or twist a little and she torqued just right to get it off? But that mare has opinions. And the longer I try to find out what they are the more she tells me. Getting shoes on- I work to keep her compliant and still. She behaves but she doesn’t like it. Getting those two back shoes pulled I could have left her ground tied and walked away. She didn’t twitch for a fly landing on her. She was perfect. When do the coincidences add up enough to being intent? Fly mask is another example. Why don’t you use a fly mask? Look at all the flies on her? She hates them. The last time I put a fly mask on her she came to the metal gate I’d just gone through and BANG BANG BANG BANG BANG with her hoof. I have never seen her do that before or since. I took the fly mask off and she walked off calmly to eat. I’ve tried it – doesn’t work. 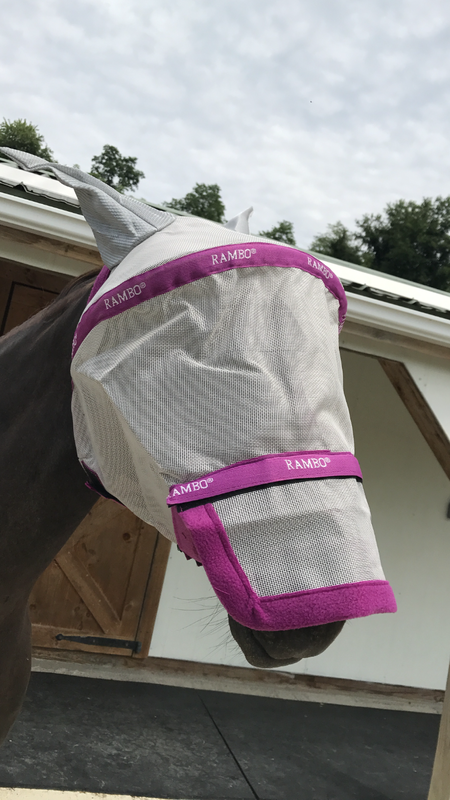 How about this new fly mask that doesn’t poke their eyes and sit on their face? Ok… sure I’ll give it a try. She hung out quietly and didn’t seem to mind it. Now if she stands and helps me put it on next time I’ll know she has a different opinion of this fly mask and if she walks off she probably still hates it. Or maybe just doesn’t want it at that time. It’s a much more interesting journey when I’m able to include her in the decisions of her own care and tack. To stop looking at her behaviors as training issues and first ask what she is saying. I’m astounded by the layers she’ll communicate if I am willing to listen. Then if I need her to help me out (training issue) I can ask, and show her what I need, and she is more willing to help. It’s such a better process for us both. Previous: Previous post: Seek… and ye shall find. Yes! I know it’s likely the slims are going to be better for her!! I haven’t been able to obtain them yet- I heard they aren’t ‘out’ yet. 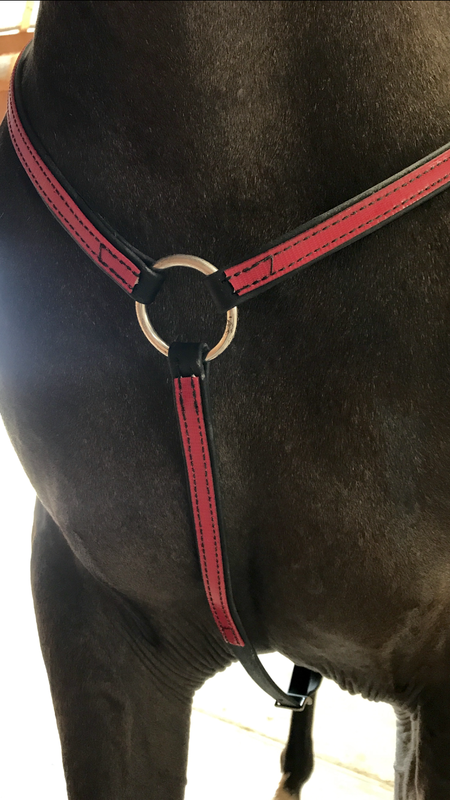 I haven’t sent pictures – the size 3 have been fitting great on her fronts and I haven’t lost one as of yet – the size two seem to be ok on her back feet but I’ve just pulled her back shoes within a week so haven’t done many rides on them yet to truly test them. You sent me a size 2 for her back feet. They appear to be the normal boots. 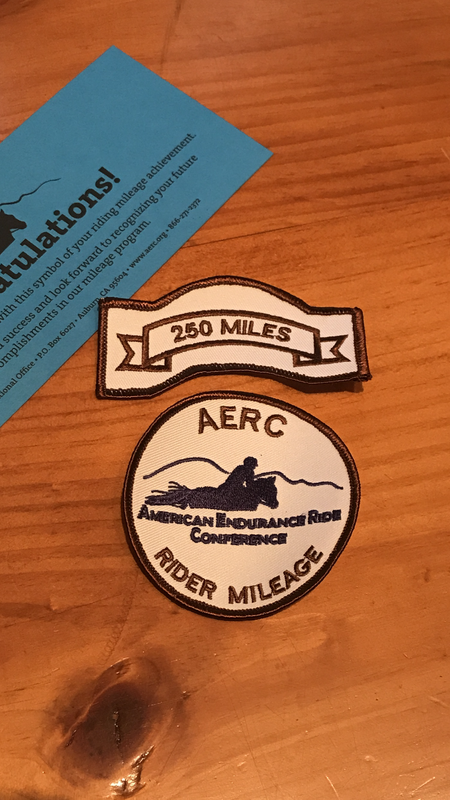 I’ve ridden a few rides in them and they’re doing well.